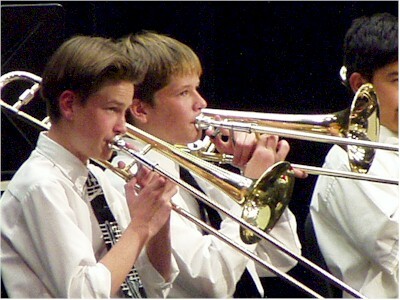 Scott's band played a concert at Matt's high school today. Actually, five or six different bands played and Scott was in two of them: the Wind Ensemble, which is the best of three bands in which 8th graders could be placed at the beginning of the school year, and the Select Band, which is comprised of a few of the best students in Wind Ensemble selected especially by the band director. This is the trombone section of the wind ensemble, warming up before their concert. We had a nice dinner at Cotija's after. I had a machaca burrito. Sorry, no food pics this time.